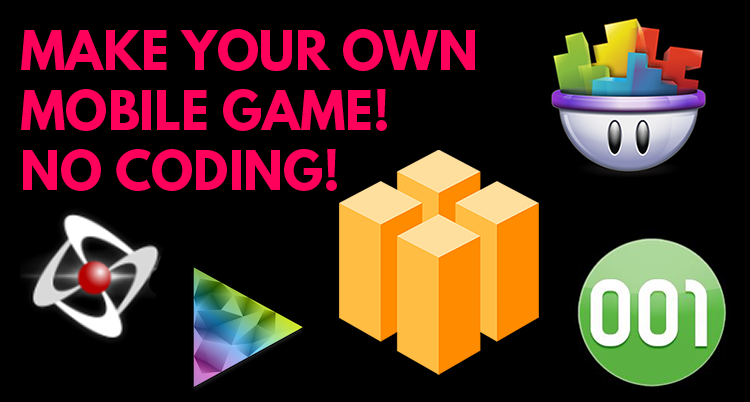 Make Your Own Games with No Coding Using Drag and Drop Game Engines! First of all, we have Unity. We have Unreal too. We think they're great, but they're not for everybody. Instead of making an article about them, like all gamedev-related websites already have, we decided to be hipsters today and talk about game engines that you probably haven't heard of yet but are pretty great. And since a lot of youngster gamedevs have been asking for help recently, we'll talk about drag and drop game engines for iOS and Android that require no coding, and no programming at all. We're not going to talk about Stencyl, Construct 2, Construct 3, and RPG Maker, though, because we haven't had the chance to try them and don't plan to. We have GameMaker, but we didn't include that in the review since it doesn't really fit the article much. If we get some stuff wrong, we'd love to hear from you in the comments section below. We'd love to learn more about these drag and drop game engines too. If this article lead you to eventually using and sticking with one of these engines, please let us know! Maybe you'd like to publish with us? So, disclaimer: these are our personal opinions based on our experiences using these game engines. Try our games here. Before Buildbox existed, GameSalad was, in our opinion, the easiest way to make your mobile games. All you needed was basic understanding of coding and some common sense so you could drag and drop behaviors to make your game come to life. The GameSalad even builds your APK and iPA for you online. What we didn't like about it was that whenever you changed scenes in your game, it takes time to load. Every GameSalad dev hated that loading circle animation near the corner of their apps. Implementing IAPs took a lot of trial and error for us, though. Ad integration is painless. If you're an AdMob user though, you had only one option: banner ads or interstitial ads? And you can't have both. Another thing that bugged us too was that there were no options to integrate Google Play leaderboards for Android. You can only have Amazon Leaderboards in your Android builds. There are performance problems too. Nothing too big, though. But seeing the frame rate go down just when things get intense is a little heartbreaking. Making resolution responsive games gave us a huge headache though, so we just decided to either stretch or letterbox some of our GameSalad-made games. Sad. Great thing about GameSalad though is that you can make any game under the sun. So long as it's 2D. You can even prototype your games while not using the engine itself. We spent our bus commutes with a notebook writing "if game.start is true, then...". Clickteam Fusion 2.5, in our opinion, isn't as easy as Buildbox and Gamesalad, but it's a veteran game engine capable of amazing 2D and pseudo 3D games too. Hey, maybe that's why it's called 2.5? Haha. Get it? 2.5D? anyone? Okay. We're just going to say outright that the interface is ugly. It looks very dated. You can download skins for the program's visual editor though. We were very confused with the visual editor, at first. But, once you follow the Flappy Bird tutorial called Faulty Flap and a few tutorials from a Youtuber called Sparckman, everything's a breeze. Adding ads was uncomplicated but we had to follow a video tutorial to add the AdMob behavior into a scene and modify it to load and play ads. It only took a few clicks exporting our Android and iOS builds. One thing we realized real quick was that this engine isn't primarily aimed at making mobile games. Some extensions that we used worked fine for the PC port of our games, but we found out real quick that some of these extensions didn't work for mobile. We don't remember being successful with integrating in-app purchases. It's probably just us being complete Clickteam newbs. To be honest we didn't buy 001 Game Creator's license but we did try the demo. We bought licenses for all the other engines but not this one. Why? We heard it didn't have monetization options. We couldn't put ads. We couldn't put leaderboards. We couldn't put in-app purchases. We only had to sell the games we make on the App Store and Google Play. We didn't like that restriction. We also couldn't find any other iOS or Android game made with the engine. We asked around on the forums. We asked the community hub on Steam. No one was answering. We wanted to see the performance of other games made with the engine before we bought the fairly cheap license. We liked the demo though. It allowed us to make RPG games easy. There's also a demo for a touchscreen-based 2048 clone that looked cool and seems to fit other mobile screens. But, we couldn't build an APK for it to test it because of demo limitations. There were also other templates available via DLC such as FPS Toolkit and MMORPG, but we're guessing they would only work for PC game creation. We personally can't wait to see what 001 Game Creator users come up with in the near future. Hopefully, for mobile. This is the stranges one of all, but had the biggest potential. Too bad their games aren't exactly visually appealing, or fun. The interface is weird. But, it has features not natively available in any other engine on this list. What separates this one from all the other engines on this list? Real time editing of your games. I'm serious. You want to add a tree next to your character? Add it in the editor and it magically, in real freaking time, adds that tree for all iOS and Android users. No need to update your games, ever. How would that pass the App Store's review process? We don't know. We haven't made games with this one yet. We downloaded this game called Bieber Run and it worked fine on our device. Other online multiplayer games took forever to load though, must be something wrong in the server side of things. Sometimes the editor, since it's online, took forever to load too. We were astonished by the ability to create online multiplayer fighting games, RTS games, and shooter games. Even has a Minecraft like template. You can add your own 3D assets, splash screen and other images for free. It reminded us of Cyberix3D, a free online gamemaker which also exports to Android. The catch 22 is, PLAYIR has their ads playing on your game. If you want them removed and have your own ads on there, you have to pay a subscription fee. You also need a subscription to natively export iOS and Android builds so you can upload the game yourself in App Store and Google Play Store. Without a FAQ on their website and a proper forum we couldn't find out if ending your subscription fee would mean the PLAYIR ads will return to your game. Needless to say, we're interested in this one. Buildbox is, in our opinion, the easiest 2D game-making engine out there. We actually had our fair share of games made with this engine (check our homepage). With several gameplay templates for you to play with, an easy to understand interface, and the ability to just drag and drop game assets into the playing field, it literally feels like making a game is as easy as making a PowerPoint presentation. However, most users will feel the gameplay types they can make are confined to the readily available presets. This isn't really the case if one masters the engine. Buildbox's ad integration is extremely straightforward too. No headaches trying to put AdMob or Chartboost codes into the project, you just have to paste the ad ids. Easy. Things like making your game responsive on different screen resolutions, implementing in-app purchases, and exporting your game to iOS and Android were a breeze. The main con about it right now is that these engine is mostly limited to making casual games where main goal is getting the highest score out of each game. Users have found ways to play with the engine though, us included. Buildbox has announced that it will integrate features that allow for more complex game creation soon. Think stats, level ups, extra lives, and other things that tickle a RPG enthusiast's fancy. Next year, Buildbox 3 will introduce the ability to create 3D games with the same drag and drop functionality. We haven't been this excited since the announcement of a 3D drag and drop software called Spark Game Engine. While Spark Game Engine never made it through beta, we're pretty sure we'll all be playing with Buildbox 3 games next year. And we can't wait. Got some questions? Send us a Tweet. WHICH VISUAL NOVEL ENGINE IS BEST? PRICE. 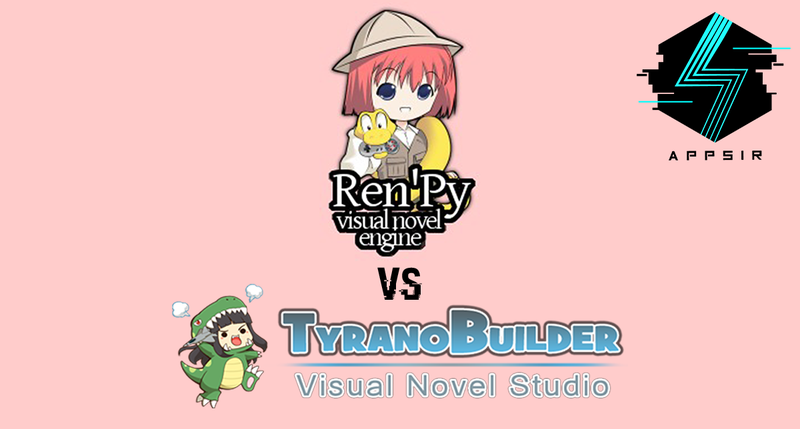 Ren'Py is free while TyranoBuilder is priced at US$14.99 on Steam with occasional discounts. Will TyranoBuilder justify its price point by having features that its free alternative does not? EASE OF USE. Some of Ren'Py fans have argued that the scripting they use is simple enough and that TyranoBuilder's drag and drop editor is unnecessary. Others argue that they were more able to make visual novels much faster on TyranoBuilder than they ever did with Ren'Py. Which one will allow us to finish our games faster? EASE OF EXPORT TO iOS & ANDROID. AppSir, Inc. does not have a Mac. We are Windows PC users for life! We export our games to iOS using MacInCloud's basic US$30 plan, which means our inability to install software and lack of access to Admin rights on our Mac. This could mean that the exporting process for either software might give us problems. Preliminary research suggests that both programs require multiple complicated steps to publish on iOS and Android platforms. Which painstaking process will be easier? MOBILE PERFORMANCE. Will Ren'Py and TyranoBuilder support multiple resolutions for mobile? Will the games from either software be resolution responsive or will they be letterboxed? Will games built on either program be free from lags, glitches, and other performance problems? Will we be able to implement ads in TyranoBuilder? SPECIAL FEATURES. Some have argued that TyranoBuilder is okay for those wanting to build basic visual novels, but complex visual novels are better off made with Ren'Py. Others say that exclusive features such as Live2D make TyranoBuilder superior. We want jaw-dropping visuals for our visual novels. Which one will provide us with these capabilities? We'll publish Part 2 of this article as soon as we answer these important questions. Stay tuned!